Regardless of what you like to call ‘the king of vegetables’ (as the eggplant is referred to in India), it is a fruit (yes, like it’s cousin the tomato, really a fruit and not a veg) whose exotic taste and texture lend itself well to a number of dishes from around the world: Moussaka in Greece, Parmigiana in Italy, curries in India and Asia, Baba Ghanoush in the Middle East just to name a few. 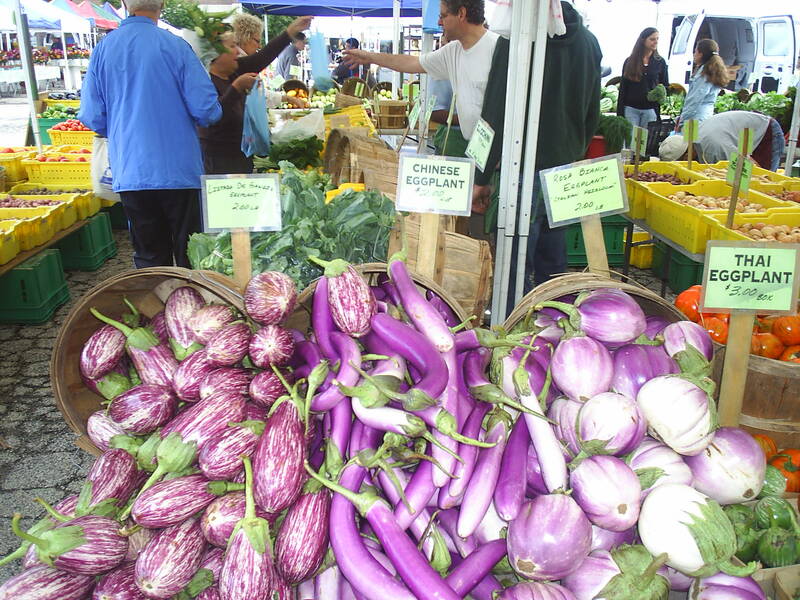 There are so many gorgeous varieties at the Farmers Market right now from the familiar dark purple Italian, to the long & lean japanese and chinese, to the white & purple striped Rosa Bianca that lends itself so well to grilling, to the tiny green and orange thai that are the perfect foil for a curry. 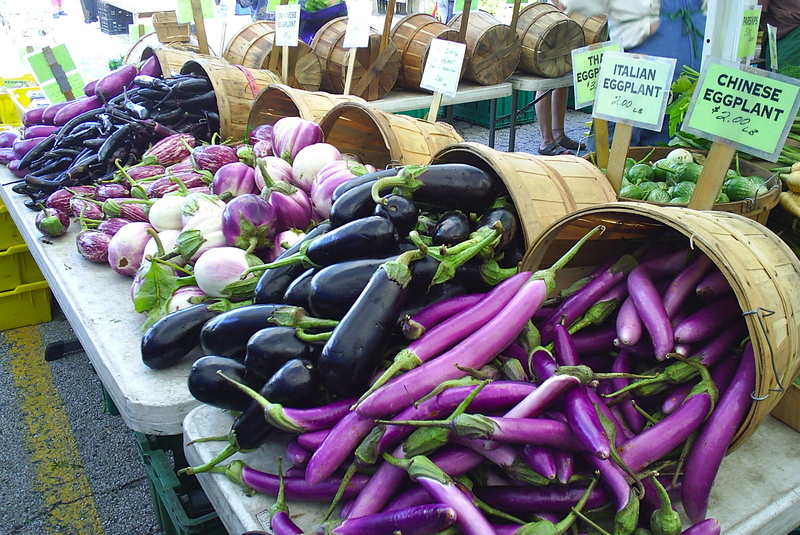 Pick out firm, smooth-skinned eggplants that feel heavy for their size and have a bright green stem and cap. How can you tell if the eggplant you picked out is ripe? Press your thumb on the eggplant, if the flesh gives a bit and bounces back you have picked a perfectly ripe eggplant. No give? Put it back. Once you have your eggplant home if you are planning to cook the same day just leave it out on the counter. If not, store in a plastic bag in the fridge and try to use within a couple of days. Need to use later than that? Blanche or steam and then store in the freezer for up to 6 months (great addition to winter stews, soups and vegetarian chilis come colder months). Now this is one piece of produce that you won’t want to eat raw….rather bitter. But cooked? The transformation rewards us with rich and tender flavor. 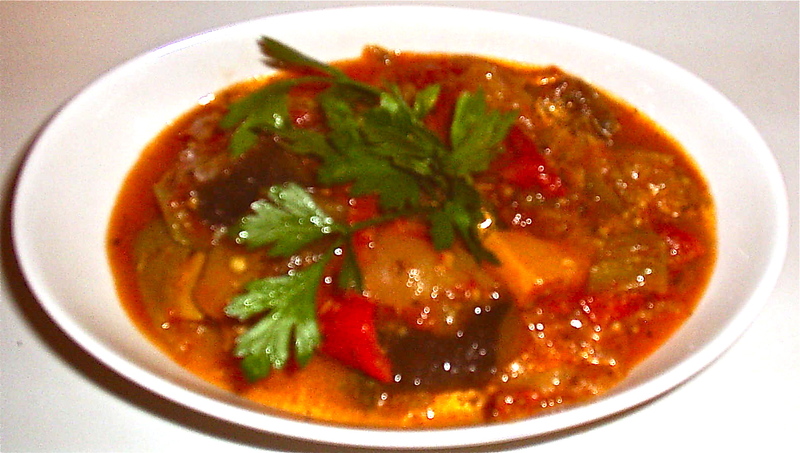 As someone who loves eggplant, I enjoy it in it’s many global guises, but one of my favorite ways to enjoy eggplant is the French dish (not animated rat) ratatouille. Since the markets are peaking right now, ratatouille is a perfect dish to highlight the other current market stars like zucchini, onions, peppers, and tomatoes. In a large skillet heat the olive oil over medium heat. Add the garlic, onions, bay leaf and dried thyme (if using fresh thyme add after vegetables have cooked down) and cook until onions are tender. Add the bell peppers,eggplant, and squash, continue to cook for 20 minutes. Add the tomatoes and cook for another 15-20 minutes until all the vegetables have cooked down. Add salt and pepper to taste. Serve as a side or over cooked polenta for a fantastic vegetarian main course. Garnish with parsley, a squeeze of fresh lemon or balsamic vinegar, some olives and capers. This entry was posted in To Market with Mo and tagged Andersonville Farmers Market, Chicago Area farmers marekts, Chicago Farmer's Markets, eggplant, Evanston Farmer's Market, Farmers Markets, fresh organic, Glenwood Sunday Market, Green City Market, moira's blog, nightshade, ratatouille, to market with mo. Bookmark the permalink.